This is one of those perplexing astronomical news that make history and I can’t but mention. US scientists have found, with the help of scout satellite MESSENGER, that not just suspected Mercury’s polar water ice (in shadowed craters) is indeed that but also that confusing dark regions around it are complex organic materials, possibly darkened by the intense solar radiation that bathes the small inner planet. The team found that the probe’s reflectance measurements, taken via laser altimetry, matched up well with previously mapped radar-bright regions in Mercury’s high northern latitudes. Two craters in particular were bright, both in radar and at laser wavelengths, indicating the possible presence of reflective ice. However, just south of these craters, others appeared dark with laser altimetry, but bright in radar. This confused scientists for a while but eventually they realized that the puzzling regions actually hold water ice at a meter’s depth into the soil, where the heat of the sun can’t reach so easily. The most interesting part however is that the astronomers are almost certain now that the dark material must be complex organic matter, darkened by the extreme solar radiation. Is there life in Mercury? ¡Bumped because of correction and updates that markedly change the original! All what I said about not testing for G2a seems incorrect because one individual with this lineage was reported in the Oviedo district. This leaves 21 F(xG2a,K) individuals (15 of them from the Avilés district, making 20% of the local gene pool) in the mystery zone. They could still be other G subclades (but rare in Iberia or elsewhere in Europe), H (but normally thought as restricted to Roma People in Europe) or F* (F-other). Some rare F clades have been reported in Europe before but never in such large numbers, I believe. Sadly the authors mention for comparison old (2004-06) studies of the Caucasus, etc. which appear not to have tested for G, leading me to think (with the help of awfully presented, or rather hidden, raw data) that they had not tested for G2a. The seem to have done it after all. Thanks for noticing to Jean. Follows original entry and update (bottom) with haplogroup frequencies (based on the work of Jean Lohizun, who sorted up the raw lists into something you can at least count). This new paper on the genetics of Asturias (Iberia) seems to be of limited interest because the authors only appear interested in statistical inference, instead of properly reporting basic data as primary social service of their publicly paid research effort. They also seem dead set into not testing for well known Iberian lineages like Y-DNA G2a (or even G, never mind discerning subclades of E) something that was already obvious in their previous attempt with mtDNA, and seem oblivious to some of the most important work on the population (haploid) genetics of the Iberian Peninsula such as Adams 2008. Still it may be of interest for data miners but be warned that all the haplogroup data is only available as long unsorted PDF lists in the supplemental material (mtDNA list download, Y-DNA list download). Maybe the only highlight of the study is that the authors infer some genetic barriers within Asturias, especially segregated seem to be the coastal district of Avilés (3) and the mountain miner districts so-called Southern Oviedo and Caudal (5, 9), also including the Narcea (2) district for matrilineages (mtDNA). Meanwhile the largely Galician-speaking Eastern district of Eo-Navia (1) appears segregated only for patrilineages (Y-DNA). Figure 2. Map of Asturias showing the SAMOVA group division coupled with the inferred barriers to gene flow. only those with values equal or higher than 70 are shown. The authors find hard to understand the genetic distinctiveness of Avilés district and talk wildly about “basal F” (probably G2a but why did not you test for that?!) Haplogroup G is relatively rare in Asturias but common for example in Portugal or Ibiza, being surely an indicator of Neolithic-derived settlement (found in ancient DNA from Occitan and Catalan Cardium Pottery sites and is also the lineage of the famous Alpine mummy Ötzi, probably also of Cardial ancestry). However, as you may know, no Cardium pottery is known so far to the North or West, so it may indicate a post-Neolithic resettlement of some sort. Figure 3. PCA plot of mtDNA haplogroups of Asturias and other regions of Iberia, the British Isles and Mainland Europe. Figure 4. PCA plot of NRY haplogroups of Asturias and other regions of Iberia, the British Isles and Mainland Europe. En fin: a confusing paper that could have been much better or at least user-friendly with some little extra effort and better focus. Still worth mentioning, I guess. See also: Asturian mtDNA (on a previous paper by the same team) and category: Iberia. Based on lists made by Jean Lohizun. The origins of the Roma people of Europe and West Asia are better understood each day. have unequivocally traced these populations to the Indian subcontinent. 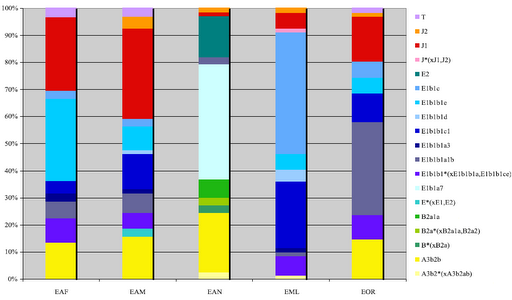 origins and later admixture with Near Eastern and European populations. recent out-of -India migration of European Roma ancestors. Figure 2. Phylogenetic network relating Y-STR haplotypes within haplogroup H1a1a -M82. I don’t feel I can say much more. Just, as usual, to insist in taking the proposed age estimates with caution. Warning (Dec 1): table 2 was so messed up that I had to postpone most of the commentary on this important paper. Please disregard this entry and head to the new, much more extensive and correct version HERE. Always welcome to find more about the genetics of India, surely one of the key geographical nodes of prehistoric human expansion (and, of course, a huge region with interest of its own right). The authors took special interest into sampling tribes, some of which are still foragers and a reference for all kind of anthropological research of South Asia, all Eurasia and even beyond. They also sorted the various populations into groups or classes based on socio-economic reality (and language in some cases) rather than the, arguably overrated, varna (caste) system. See table 1 for details. 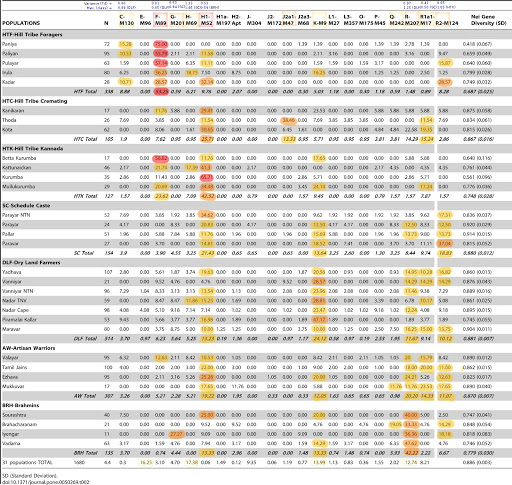 Annotated and corrected version of table 2 (click to view in optimal size). As I’m not totally sure that the tabulation (even after correction) is right, I’m going to withhold judgment. Hopefully it’ll be corrected soon and we can analyze the data properly. I am very interested on what this paper seems to have found and therefore I will wait a bit for the formal correction (which is apparently in wait for PLoS ONE editors to perform only) and write on the matter anew. Because, if nothing else, the high levels of F* and C among hunter-gatherer tribals seem very important. It has been reported today that workshops in the Chalcolithic (and Megalithic) site of Valencina de la Concepción (near Seville, Andalusia) used ivory imported from West Asia, belonging to tusks of the extinct Syrian (or also Assyrian) elephant (the westernmost variant of the Asian elephant, Elephas maximus). Until today it was generally believed (by default) that the ivory used in Chalcolithic crafting was from North Africa, however the (also extinct) North African elephant was a variant of the African species Loxodonta africana. While trade with Northern Europe (amber) was acknowledged as a matter of fact but was strongly supported by cultural elements (Megalithism), as well as by the unmistakably Nordic amber which washes to the beaches of the Baltic and German Sea, trade and cultural connections with the Eastern Mediterranean were considered speculative at best. This discovery, which traces the first (indirect?) trade with West Asia to some 4800 years ago appears to demolish almost single-handedly the usual notions about Western European Chalcolithic (c. 3000-1800 BCE) by which contacts with the Eastern Mediterranean were considered speculative or even unlikely. There seems to be a glass bead in Eastern Iberia but nothing else that could support consistently contacts with anywhere East of Italy or Lybia. Only nearing the Bronze Age (which may begin c. 1850 BCE in the most developed parts of Iberia) such connections could be taken for granted (and yet mostly because of cultural rather than material imports). However the late Megalithic burial types of the Chalcolithic (tholos, artificial caves, etc.) which partly replace the classical dolmen in the areas we could well call more civilized (parts of Southern Iberia and Languedoc), has been argued in the past to be conceptual imports from the Eastern Mediterranean (places like Kurdistan and Cyprus, where tholoi were used first for housing apparently). But a time gap of a whole millennium (or more) made it all a bit hard to accept and the competing theory of the architectural concept of false dome (tholos) being invented twice became rather mainstream. The finding has been reported in the Acts of the Congress on Ivory and Elephants, which took place in Alicante and it’s also said to be published in the Journal of Archaeological Science (but I can’t find it so it may well be awaiting publication). The research has been carried by academics from the University of Huelva, the German Archaeological Institute and the Valencina Museum. Sources[es]: Valencina de la Concepción Town Hall, Diario de Sevilla, (h/t Asociación Los Dólmenes). Christopher Andrew Plaster, Variation in Y chromosome, mitochondrial DNA and labels of identity within Ethiopia. The Center of Genetic Anthropology, University College of London, 2012 (doctoral thesis) ··> LINK (PDF). The study deals with the anthropology, ethnology and linguistics of the African state, and especially with the haploid genetics (although more in detail with the Y-DNA side of the matter than with mtDNA). It is very much worth reading for anyone interested on the anthropology and population genetics of Africa and in particular the Horn region. What I have in mind is, first of all, that those populations who have the most Eurasian (F-derived) Y-DNA lineages also have the most Eurasian (N, M) mtDNA ones. 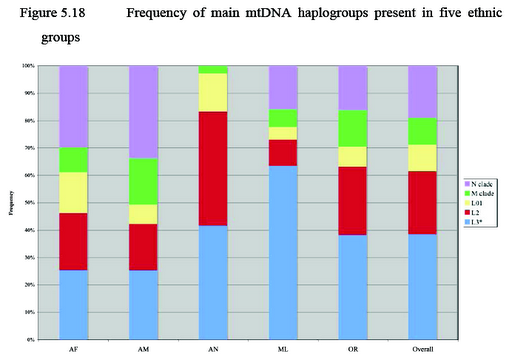 However there is noticeably greater apportion of mtDNA from Eurasia than Y-DNA – and most of that excess corresponds to mtDNA M (all of it M1). In a simplistic scenario in which one or several waves from Eurasia would be the only element to consider, we would expect similar apportions for male and female lineages or even noticeably more immigrant Y-DNA. This is not the case and therefore it is perplexing. After some thoughts on the matter I realized that the situation is similar, mutatis mutandi, to the one of North Africa. This probably means that the cause of both anomalies can well be the same: a relatively recent (Epipaleolithic?) expansion of Afroasiatic-speaking peoples with mostly African male lineages (typically E1b1b-M215). But notice that in North Africa also J1 (ultimately from West Asia) appears to be also important in the Afroasiatic phenomenon, as it is in the Horn (and certainly in West Asia), making the situation even more complex for interpretation. 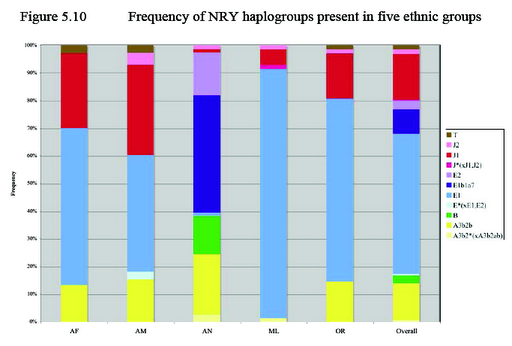 In this regard it is worth mentioning that haplotype networks from this study show that while the Amhara and Oromo J1 is intermingled and diverse, the Afar J1 forms a very tight cluster, strongly suggestive of an ancient founder effect. Another such apparent correlation could be Y-DNA E1 and E1b1a7 with specific subclades (?) of mtDNA L0/L1 (probably L0) and L2. At least the apportions are almost identical among the Anuak (but not among other groups, hence why I suggest specific subclades to be determined). The Anuak seem the most purely African population among this selection with only 3% of M1 and 0% N.
I would seem that even the Omotic, the most remote Afroasiatic branch according to linguists (some even consider it a distinct family), have some Eurasiatic genetic influence. However I’d say that this influence is at least largely pre-Neolithic and has been subject to deep reshaping by internal African dynamics as suggested above. Still Neolithic and even maybe post-Neolithic layers of West Eurasian deposition are also apparent in the structure – always in my understanding. Ethio Helix has updated with extra information not included in the thesis. Notable is a graph with much greater detail on the Y-DNA haplogroup distribution. The E1* block is now split between a number of E1b1b subclades and some important dose of E1b1c, which is the dominant lineage among the Maale (and hence maybe among other Omotic peoples). 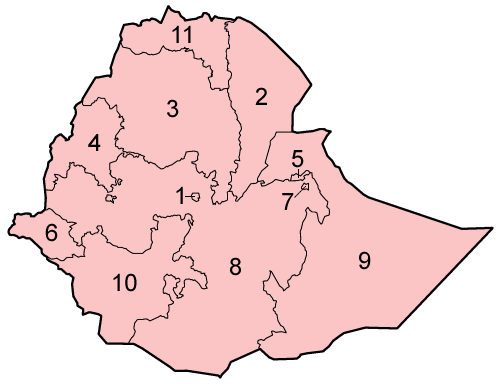 Among the E1b1b sublineages, the Afar are relatively dominated by E1b1b1e, while the Maale have an important bloc of E1b1b1c1 and the Oromo appear dominated by E1b1b1a1b. The B bloc is also split in several subclades, all them only relevant among the Anuak (most of it B2a and most B2a within B2a1a. It is also quite notable that some J(xJ1,J2) has been found among the Maale. For reference on this rare paragroup, I’ll mention that another niche of J* is the nearby island of Socotra (74%, probably a verly local founder effect and specific lineage to be described) and there is also some J* reported among peninsular Arabs, some Turks, Greeks, Jews and a few others – but otherwise most Y-DNA J either belongs to J1 or J2.